The days have long since gone when the major bus operator along the North Wales coast was Crosville Motor Services. In Chester, home to Crosville’s head office, the streets were also graced with the Massey bodied Guy Arabs of Chester Corporation buses from the late 1940s to the 1970s mingling with the Bristol/ECW vehicles of Crosville. 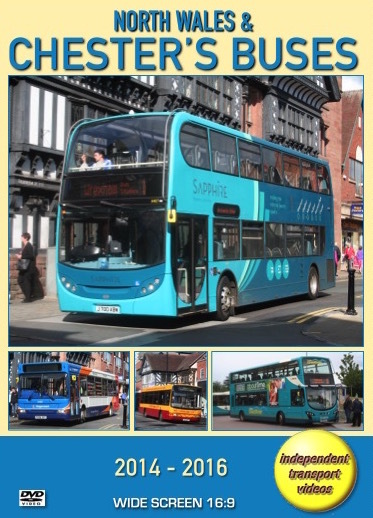 All that has now changed, fast forward to 2014 and we see the main operator along the North Wales coast is Arriva Cymru (formally Crosville Wales) and in Chester we have Stagecoach (Merseyside & South Lancs) along with Arriva Cymru and Arriva North West. Local serves operated by Arriva in Chester are branded as Chester City Bus. There are also a number of independent operators that provide services in Chester filling the gaps where the big groups don’t operate. On this programme we see buses operating from Helms of Eastham, Arrowebrook Coaches, Aintree Coachline, Vale Travel, D. Jones & Son from Wrexham and the now defunct G.H.A. Coaches. Our filming begins in May 2014 at Llandudno, on the same weekend as the famous ‘Llandudno Transport Festival’, where we see the latest ADL400 double deckers operating with Arriva Cymru alongside single deckers from the fleet. Locations include Mostyn Broadway, The Parade and Mostyn Street. We then move along the coast to Colywn Bay and film Arriva vehicles on Abergele Road and Conway Road. We see a number of MPD Dennis Darts, now removed from the fleet due to recent DDA legislation. Our next location is Rhyl. Filming takes place in the bus station and along the High Street. Here we see low-height Wrightbus bodied VDL DB300 double deckers with ‘Cymru Coastliner’ branding recognising the famous route started by Crosville in the mid 1960s. Our next stop is the bus station in Prestatyn where we catch up with more buses from the Arriva Cymru fleet. Now we have a look at Chester, starting with some archive video from the camera of Malcolm King shot in 1990. We see Daimler Fleetlines and Dennis Dominators from the erstwhile Chester Corporation fleet, as well as a Bristol VRT and Leyland Olympians from the Crosville and Crosville Wales fleets. Moving to the contemporary era we begin our filming in 2014 along Northgate Street and Foregate Street – just see how things have changed! A visit in May 2015 calls at the Bus Exchange and Northgate Street, and later on that year our cameras visit Foregate Street, Pepper Street and return to the Bus Exchange where we see an open top Alexander ALX400 DAF DB250, 3990 (S243 JUA), branded as ‘Roller Coaster’ from the Arriva depot at Rhyl on driver route learning duties. Further filming takes place in Northgate Street, Gorse Stacks and Frodsham Street. Our visits during 2016 are also of great interest. We see the introduction of ‘Stagecoach Gold’ branded services with refurbished Solos on route 5 and new ADL Enviro300 single deckers for routes 1 and 2, the Chester - Liverpool service. Also new ADL200MMC single deckers for the rerouted Chester Park & Ride services replacing the Wrightbus Eclipse Volvo B7RLEs introduced by Firstbus in 2009. Locations include the Bus Exchange, Frodsham Street, Vicar’s Lane, Love Street, Union Street and many more. We are sure you will enjoy this packed visit to Chester and the North Wales coast where the bus interest still carries on!